Parents! Are you thinking about getting your kids into commercials or TV? Have you already started but need more instruction to keep their career rolling? Join us at The Acting Center and meet Amanda Reed. 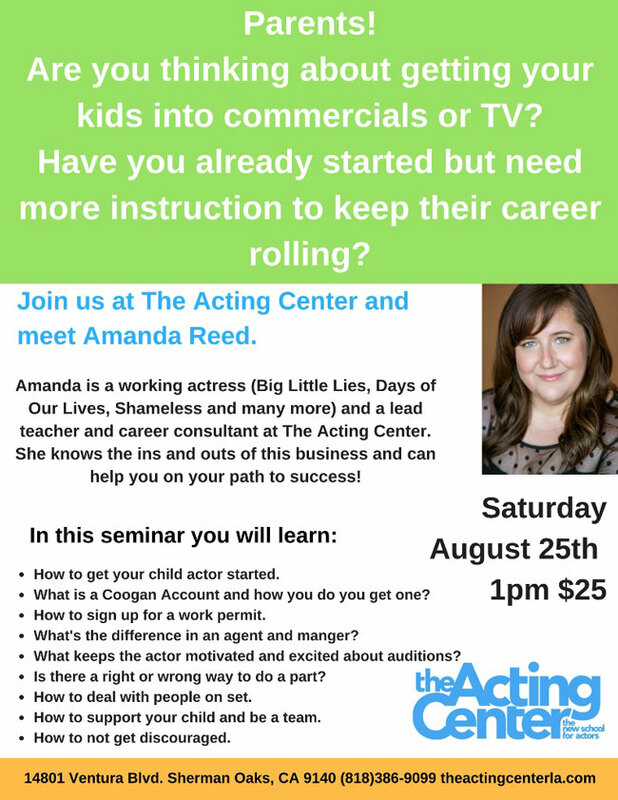 Amanda is a working actress (Big Little LIes, Days of Our Lives, Shameless and many more) and a lead teacher and career consultant at The Acting Center. She knows the ins and outs of this business and can help you on your path to success! How to get your child actor started. What is a Coogan Account and how do you get one? How to sign up for a work permit. What’s the difference in an agent and manager? What keeps the actor motivated and excited about auditions? Is there a right or wrong way to do a part? How to deal with people on set? How to support your child and be a team. How to not get discouraged.